My feed reader and Twitter timeline are full of posts with wish lists for next week’s Apple World Wide Developer conference. Siri this, iOS 10 that. And I’m sure some of the ideas are great and I’ll be happy when they are at my disposal. 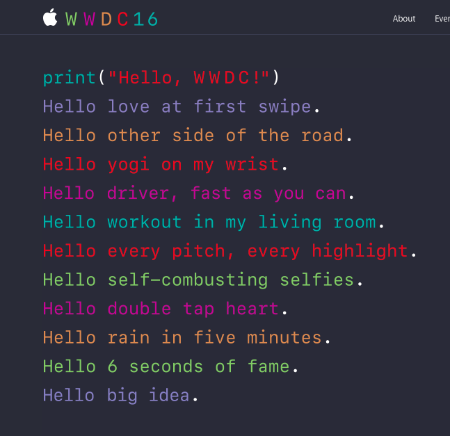 But all I want is for Apple to include the font from the WWDC web site. When the site launched, it took me some time to realize the page is a giant image. A simple monospaced font on a background you’d find in a terminal or code editor app. It’s beautiful and I want it for my own. One of the few design skills I would truly like to fully understand and be able to employ in my work is the ability to choose and use type properly. Tonight I stumbled upon a post on the TypeKit blog sharing a pdf of a previously for sale book on the subject. While it is unfortunate that publisher didn’t succeed, it is generous of the author to share it with the public. Head over to the blog to get a digital copy of Pocket Guide to Combining Typefaces. If you have other resources, please send them my way. Poking around the web this evening, I stumbled upon Your Fonts, a FREE!!! web based font generator. The process is pretty straight forward. You download the two page template (the second page is optional), and write your characters in the corresponding boxes. They recommend using a fine tip permanent marker. I used a fine point Sharpie, though I think a super-fine point might be better, especially if you have poor penmanship like myself. Once you fill in all the characters—there’s even a box for your signature, which corresponds to the carat (shift-6 on most keyboards), you scan the page and upload it via their web interface. The fonts were generated quite quickly (though I do have a pretty fast upload speed), ~1 minute later, and I was able to download the font. You get the option of naming the font, as well as adding your name to the copyright. Reading through their FAQ, you retain full ownership of the generated font, including the freedom to share or sell the font. I would recommend reading through all of the steps before uploading, including printing a second copy to practice. My first attempt I didn’t pay attention to the guides, and the bottom of a few of the characters were cut off. The possibilities of this service are endless. I don’t see why one couldn’t use the second, optional page for creating your own custom dingbats. I could also see it being a quite novel thing if you had children to have them write out their alphabet and save it for posterity. Any family member for that matter. Imagine having your parent’s or grandparent’s handwriting archived. Anyway, I thought it was a super cool discovery, and well worth sharing. If you create your own, I’d love to see it.